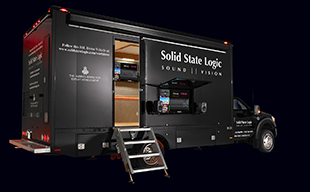 OXFORD, ENGLAND - Solid State Logic is extremely proud to announce Fusion, an all-analogue 2U outboard processor created for the modern hybrid studio. Fusion introduces five completely new analogue colouration tools designed to bring the perfect combination of added tonal character, weight and space to your mix bus or stereo stems, with the detail, warmth and finesse that only real analogue circuits can provide. James Gordon, CEO of the Audiotonix Group, comments: “The introduction of Fusion marks the arrival of new studio tools from the studio masters that will colour the records we hear in the future. Having been fortunate enough to see and hear the development of this new unit, I think it leaves a strong impression of what’s to come." A new High Frequency Compressor delivers the distinctive sound of high frequency rounding in the analogue domain. A compressor that effects high frequencies only, optimised for smooth and transparent harshness reduction and a tape-like high-frequency roll off – great for taming brittle high frequency fizz. Fusion will be available worldwide from November 2018.